Fed money printing vs. IMF money printing: What’s the difference? A lot of people scratched their heads this morning when the president said Germany is “totally controlled by Russia.” Not us. Not after what we’ve chronicled for the last year. Nearly a year ago, Donald Trump signed into law a bill that, among other things, imposed sanctions on companies involved in financing Nord Stream 2 — an offshore natural gas pipeline pumping Russian gas to Germany. His 60–70% figure might be inflated, but Germany does need gas to stay warm in the winter — and to wean its power grid off the nuclear plants it plans to shut down by 2022. 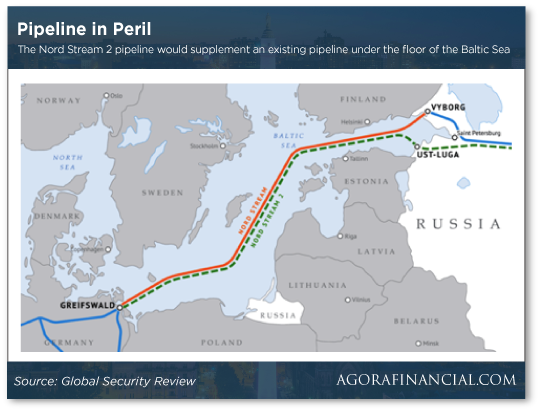 Nord Stream 2, covering a slightly different route than the existing Nord Stream pipeline from Russia, would go a long way toward meeting Germany’s future gas needs. German Chancellor Angela Merkel pointed out that Nord Stream 2 is backed by private investors in Germany and elsewhere in Europe — not by the German government. It comes down to this question: If Germany can’t get its growing gas needs filled by Russia, who else can step up? As we said when the president signed the sanctions legislation last August, the only other viable option is LNG — liquefied natural gas shipped on tankers from the United States. Why don’t the Germans do it? Cost. The process of supercooling gas into a liquid state at a U.S. port… hauling it across the Atlantic… then returning it to gas form at a European port… adds at least 20% to the cost compared with Russian gas transported via pipeline under the Baltic Sea. The big gun in liquefied natural gas exports is Cheniere Energy Inc. — with the appropriate ticker symbol LNG. Follow the money with us for a moment. 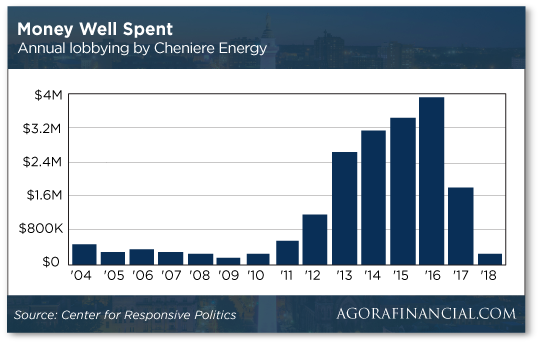 Starting in 2013, as the shale energy boom made it evident that America could become a natural gas exporter, Cheniere stepped up its lobbying efforts in Washington — big-time. LNG spent $4 million in 2016 alone. LNG shares are down nearly 2% this morning despite the bullish news from Brussels. But that’s only because the broad market is selling off thanks to renewed trade war tensions — about which more shortly. In the spring of 2015, we took note that LNG was the biggest holding in the portfolio of Baupost Group — the firm run by hedge fund legend Seth Klarman. Klarman started buying in 2014 around $48 a share. 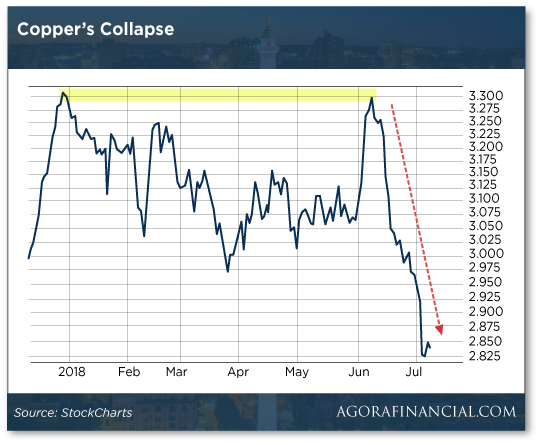 He rode it past $80 later that year and held on through a sickening decline below $25 in early 2016 — adding to his position along the way at $37. This morning, it’s $63.24. Looking at Baupost’s most recent 13F filing as of March 31, LNG is still Klarman’s biggest holding. It makes up 10.7% of the portfolio. That’s long-term thinking. LNG is an outrageous example of crony capitalism in action. It’s also probably a strong buy at present levels. So, about those new trade war tensions: They’ve dragged down the Dow about 150 points as we write. That would be on top of the 25% tariff on $34 billion in goods that took effect earlier this month. They could come into effect as early as the end of August, after a public comment period. Meanwhile at a meeting in Geneva, the U.S. ambassador to the World Trade Organization says America’s trade disputes with China are too big for the WTO to resolve. Ambassador Dennis Shea: “Given China’s very large and growing role in international trade, and the serious harm that China’s state-led, mercantilist approach to trade and investment causes to China’s trading partners, this reckoning can no longer be put off. The good news for U.S. stocks is that earnings season gets underway in two days. That means stocks will become less reactive to headline news and more responsive to companies’ sales and profits and projections for the future. As our Alan Knuckman has been saying for weeks now, analysts at FactSet forecast 20% earnings growth year over year this quarter. That’s a slower pace of growth than the last quarter… but it’s still the second-fastest growth rate in nearly eight years. Meanwhile, revenue growth is projected at 8.7% year over year — the best in nearly seven years. Not too shabby. And Alan is positioning his readers to profit in his earnings-driven trading service: Only this morning he recommended a trade with potential to double your money over the next six months. Sound attractive? You can check out Alan’s earnings trading strategy at this link. Please note: Because earnings season starts on Friday, the link goes dead at midnight tomorrow night. While we have trade wars on the brain, we have a follow-up on a potential casualty of the steel tariffs that came into effect on June 1. Two weeks ago we told you about Mid Continent Nail Corp. of Poplar Bluff, Missouri — which employs 500 people in a town of 17,000. It’s responsible for about half of U.S. nail production… but because of steel tariffs, about 200 of those workers could soon be let go and the whole company faces shutdown by Labor Day. The problem is that Mid Continent gets its steel from its parent firm in Mexico. Thus, its raw materials are subject to the 25% tariff. This is how it goes with tariffs: Domestic steel jobs are saved, but jobs dependent on cheap imported steel go away. When Bush imposed steel tariffs in 2002, it saved 3,500 steel jobs — at the cost of at least 12,000 jobs in other industries. Now here’s the weird thing: By and large, the townsfolk would “never hold the loss of those jobs against Trump,” reports The Kansas City Star. We remember a time — not that long ago — when conservatives called out liberals for putting feelings over facts, for letting emotions drive what should be hardheaded policy decisions. The classic example is liberal support for higher minimum wages, when every ounce of evidence shows that raising minimum wages has the effect of pricing some people out of the labor market — that is, putting them out of work. But it makes liberals feel good, and to them that’s all that matters. The steel and aluminum tariffs are making themselves felt in wholesale prices. The Labor Department is out this morning with its producer price index. It jumped 0.3% for the month of June, more than expected. If you factor out food and energy prices, it’s still a 0.3% increase. Among the drivers of the increase — steel mill product prices up 1.9% and aluminum mill “shapes” up 2.1%. And those come on top of steep gains going back to March, when the tariffs took effect. The question now is whether businesses are able to pass along those rising costs to consumers. We’ll have an answer with the consumer price index due tomorrow. The trade war talk is also knocking the stuffing out of the commodity complex today. Case in point: Crude prices should be rallying hard this morning after the Energy Department’s weekly inventory report. It showed U.S. oil stockpiles plunging 12.6 million barrels in the week ended last Friday, to 405.2 million barrels. That’s 18.2% below levels a year ago. Inventories are tight! Yet because the vibe is that trade wars will put a damper on global commerce in general, a barrel of West Texas Intermediate is down more than 2% at $72.38. Gold is caught up in the selling, too. The Midas metal is back to $1,245 — once again approaching that danger zone around $1,240 that marked a bottom last December. The 5: The difference is that the IMF retains a shred of money-printing credibility while the Fed and the other major central banks do not. 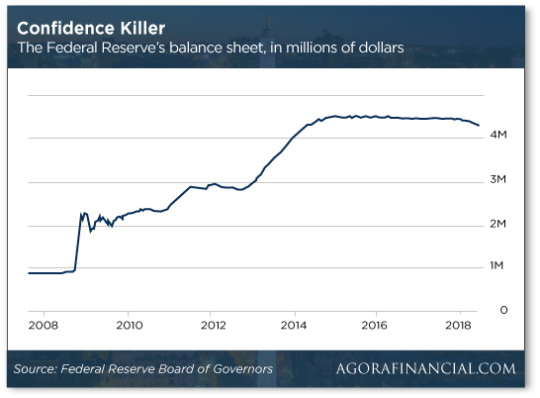 In response to the Panic of 2008, the Fed blew up its balance sheet from (roughly) $900 billion to $4.5 trillion by late 2014. Under the “quantitative tightening” that began last fall, the number has pulled back slightly to $4.3 trillion. Assuming everything goes according to the Fed’s plans — heh — the balance sheet would shrink to a still-ginormous $3.4 trillion by year-end 2019. Now… What if the next big financial crisis hit between now and year-end 2019? The Fed would have to blow up its balance sheet yet again. How big would it have to be to pump enough liquidity back into the system? $5 trillion? $6 trillion? $8 trillion? That’s why Jim believes the IMF would ultimately step in. It doesn’t have that credibility problem. Its balance sheet isn’t nearly as leveraged as the Fed’s or the European Central Bank’s or the Bank of Japan’s. It can print SDRs to a fare-thee-well. Meanwhile, you and I will continue to transact in dollars, Europeans in euros, Japanese in yen and everyone else in their own local currency — which will rapidly lose value thanks to the proliferation of SDRs, but the man in the street will have no idea of the connection. P.S. Earnings season starts in two days. Will you be positioned to profit? Alan Knuckman is making an unprecedented profit promise… and he’s putting an unprecedented guarantee behind it. Check it out for yourself —there’s no long video to watch — and be sure you do so before midnight tomorrow night. The offer is off the table once earnings season is underway Friday.